9. 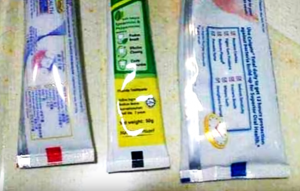 Have you ever noticed the colored squares on the center of the bottom ridge on toothpaste tubes? Well, these colored squares actually have a purpose! The squares are called “color marks,” which are created when being manufactured, the various colors indicate whether the packet can either be folded or cut.